So Eastman Kodak has declared bankruptcy. Right now, Twitter is like a wake for this most beloved of American companies. I refuse to speak of Kodak in the past tense, though: bankruptcy protection is not a death sentence, and when it says, as it does in its press release, that it intends to “emerge a lean, world-class, digital imaging and materials science company,” I’m rooting for it to do exactly that. But like everyone else who grew up shooting Kodak film–often in a Kodak camera–I’m feeling wistful about the brand and what it’s meant to me and the world. 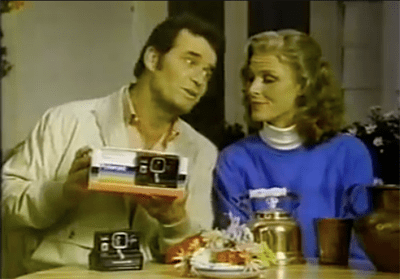 How about watching a few vintage commercials, including two versions of the once-famous tear-jerker “Turn Around” and ones starring the Nelsons, the cast of Bewitched, Michael Landon, and Bill Cosby? We’ve investigated and are taking manual action to demote www.google.com/chrome and lower the site’s PageRank for a period of at least 60 days. We strive to enforce Google’s webmaster guidelines consistently in order to provide better search results for users. While Google did not authorize this campaign, and we can find no remaining violations of our webmaster guidelines, we believe Google should be held to a higher standard, so we have taken stricter action than we would against a typical site. Yesterday, Aaron Wall and Danny Sullivan reported on an odd Google marketing campaign–okay, a troubling one–that apparently involved Google paying bloggers to publish posts that embedded a Google video featuring Vermont flour maker King Arthur Flour. The effort got mentions of Chrome onto hundreds of blogs–albeit hasty, lame references in at least some cases–and also looked like it might have been designed to juice Chrome’s Google rankings. Today, Google is disowning the campaign, which it says was conducted without its knowledge by a company with the apt name Unruly Media. Unruly says that it didn’t intend to affect search rankings. But even if it didn’t, the notion of Google products being promoted through subsidized blog posts–abysmal subsidized blog posts–is painfully cheesy. Microsoft’s got more ideas in store for Kinect, the motion-sensing Xbox 360 camera that launched last fall. This week, the company announced a lofty goal to create interactive advertising powered by voice and gestures. Don’t worry, you’re not the only one who feels queasy at the sight of more intrusive ads in the name of “audience engagement” and “social advocacy,” but there is a silver lining here: If this is what helps Microsoft lure advertisers — and by extension content providers — to Internet television, then it’s all good. Turns out, people will gladly stare at an occasional ad on their Kindles to save a little money. Amazon’s Kindle with Special Offers, an e-reader that shows advertisements and discounts on its home screen, is now available with a 3G connection. Like the Wi-Fi model, the 3G Kindle with Special Offers is $25 cheaper than its ad-free counterpart, selling for $164. The Wi-Fi version sells for $114. Twitter is continuing to monetize its service, and yes, that means more ads. They’re now appearing below the trends listings, in the section that has up until now been reserved for promoting various features of the company’s service or its own products, points out Tech Inspiration. The new ads also break with Twitter tradition by not clearly labeling the content as advertising: the only evidence that they are comes from the HTML code of the page. If you’re bummed out about Cisco axing the Flip, don’t visit San Francisco–ads like this one (in a photo I took yesterday) are a sad reminder of how recently the product appeared to be an extremely viable entity.